It's St Patrick's day, and my Twitter and Facebook feeds have been full of prayers, images, shamrock, articles and photos of Ireland. 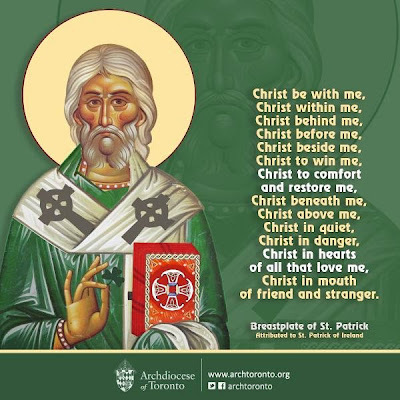 One constant throughout the day has been variations on the prayer known as St Patrick's Breastplate, or The Deer's Cry. 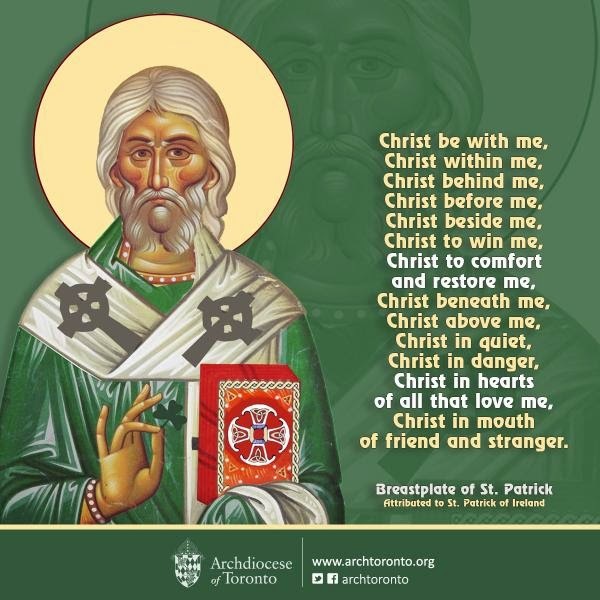 Just as a breastplate is an item of body armour, encircling the heart and vital organs, so this prayer is a form of encircling oneself in the protective strength of Christ, whose power is love. There really is nothing more to this prayer than the wish that Christ be around and within, and in all those one encounters. This version, which came to me via Twitter and originated from the Archdiocese of Toronto, is one that particularly struck me; there's the encircling and desire for protection, but also for the tenderness of Christ's comfort and restoration, maybe for those times when the breastplate feels especially thin and vulnerable. And here is one of the first things I saw this morning - Shaun Davey's lovely setting of the same prayer, known here as The Deer's Cry. And Happy Feast, whether you're fully or only remotely Irish! I have your version of St. Patrick's breastplate on a CD(someone copied it for me) but they and me had no idea who sang it. You have solved a mystery. I just love this version it gives me goose bumps and courage. Then I'm doubly glad I posted it!